This month is going to be shining on the young and promising cowgirl from Kansas City, Missouri, Miss Harlow Greenwood. 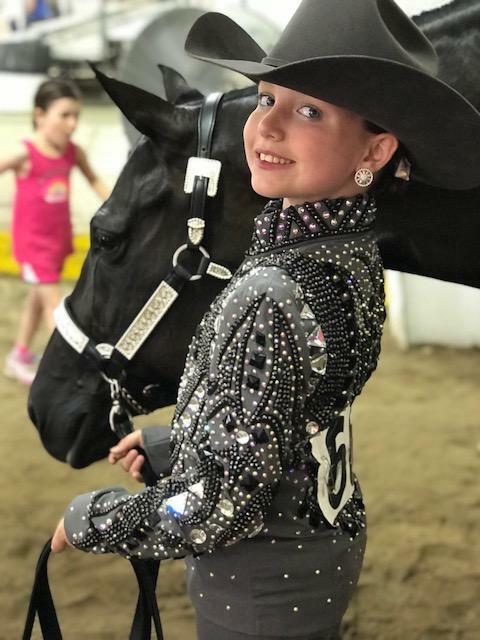 Harlow is only 8 years old and has been riding and showing since she was only 3 years old. Harlow was introduced to the horse world by her GeeGee, who started her on lessons. Not only does Harlow love riding and showing, but she even helps out with the never ending horse expenses by working to raise money for each of her shows! Harlow currently rides Krackalackin Krymsun, better known as Millie. Millie and Harlow have been knocking it out of the park for a little over a year. How these two got started is even more heart warming. Harlow had a great surprise one day that changed her whole life. Her GeeGee took her on an all day scavenger hunt. They ended up at the barn with a stall that was decorated and it said “Harlow’s New Horse”. Harlow was over the moon and that’s when the magic began. While they are just getting started, they have been showing in trail and showmanship. They just won high point at her last show! As far the showing experience goes, Harlow loves it! Her favorite part is getting to see all of her friends and walking everyone’s dogs. Her only dislike is having to leave! When Harlow is not riding, she is spending time with her brother and sister. And to no surprise, at school, Harlow just received the Most Helpful and Kind Friend award! When she grows up, Harlow wants to be a horse trainer like her current trainers, Kendra and Caitlyn. Harlow’s biggest supporters are her, dad, mom, and GeeGee. Her trainers also help her to be the best she can and do a fabulous job of making sure she understands what she is doing. Her mom, dad, and GeeGee are always supportive and are her biggest cheerleaders!